New Zealand prime minister hair-pulling: Apologizes to waitress. 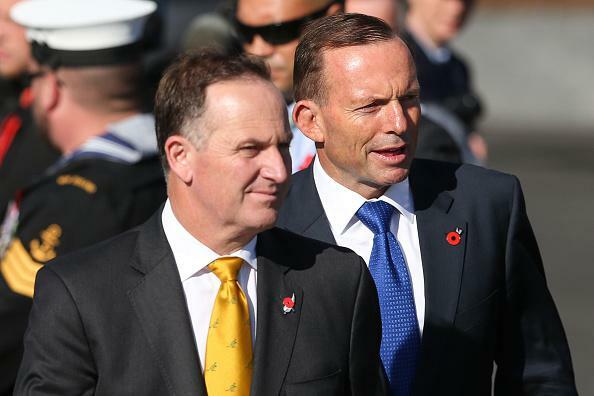 John Key, left, with Australian Prime Minister Tony Abbot. Through a spokesperson, the prime minister apologised for the hair-pulling, saying it “was never his intention to make her feel uncomfortable”, but did not dispute the waitress’s version of events. Speaking to reporters at Los Angeles airport while en route to Turkey, Key repeated the apology saying that there were “a lot of fun and games” at the cafe and “lots of practical jokes”. He would come up behind me when I was at the ordering terminal, tug on my hair and then pretend that his wife, Bronagh, had done it (much to her embarrassment), and she would tell him to stop it. As he rounded the corner behind me he commented “that’s a very tantalising ponytail”. Events reached a boiling point in March. Despite my best efforts to avoid the situation, without literally running away, he just couldn’t help himself and still attempted, from directly in front of me, to reach around behind me in search of my hair, as he walked by. That was too much, even for me. I had remained professional for absolutely as long as I could and this time I put my hand out in front of me, a barrier between John and myself, and I said “No! NO! NO! NO! NO! NO!” as I wagged my finger at him and he reluctantly backed away. As he approached me he thought it would be fitting to raise his hands high and make scary, suspense sound effects, like the music from the movie Jaws that we all know so well, and still gestured as if to reach behind me. As he towered overhead I slunk down, cringing, whilst Bronagh told him to “leave the poor girl alone”.